Babs Young was over at the Elk Rapids Area Historical Museum taking pictures of the Treasures from the Toy Chest exhibit when a class of third-graders filed in. 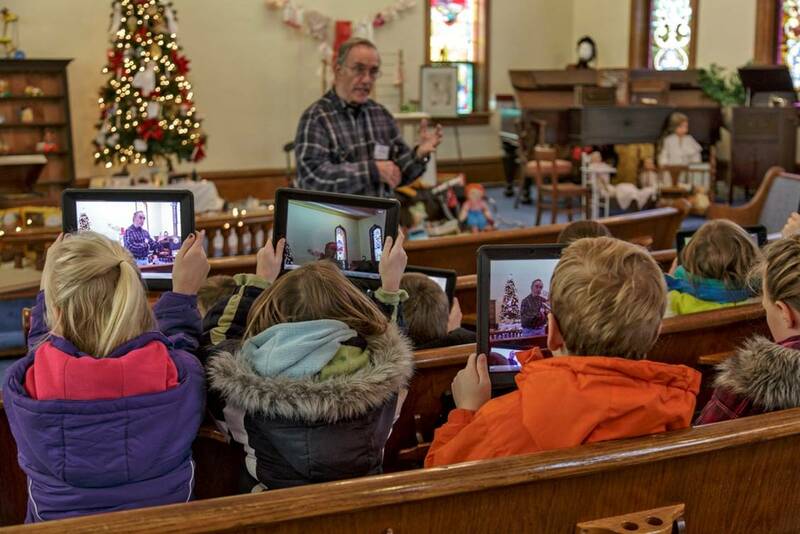 As docent Ross Graham launched into the stories of the toys and games displayed all around them, the kids whipped out their iPads and began recording his presentation. So here we are in a 110-year-old church-turned-historical museum, exploring the nineteenth century as seen through very twenty-first century eyes. My, my, imagine what the world will be like 70 years from now when these children are reminiscing for their grandchildren . . . . The exhibit runs through the first week in January at the museum, 301 Traverse, Elk Rapids. Even if you don’t have either a grandchild or an iPad, I’ll bet you’d enjoy a visit. Happy Holidays, whatever traditions you observe or begin! But my second thought was, “I wonder what toys he was showing them?” I just pulled out my grandfather’s cast iron horse and buggy – I always tuck a sprig of holly into it and set it out at this time of year. And I have my Slinky. I may take it out for a walk down the stairs later. Actually, I’m very happy. I asked Santa for rain, and he brought 2.25″ this afternoon. A little early, but I’m sure he feels we oldsters can be more flexible than the children. Hope all is well in your part of the world. It’s a hard weekend, but on we go. Ah. In order – the Elk Rapids school district has just provided an iPad to each student as an educational tool. My understanding is that they are handed out to elementary school students each day and collected at the end of the day. (These kids were using them during a field trip.) It’s a brand new program and the jury is still out as to whether it is a Good Thing or not. The toys are all kinds–including cast iron ones from your grandpa’s era and a Slinky from ours! There are 19th century cloth dolls and 20th century Barbies. I must take you all over there for a visit. I am very happy that you got some rain, and not too much of it. I am about ready to wish for snow instead of cursing it. It was a very hard weekend but on we go indeed. That photograph is a time capsule in its own right. I do hope the children leave space to play in and amongst information overload. The key question is do the children look back at what they have recorded? It does of course have a great advantage over any notes I might of taken during my education, to help me with my studies. It would be intelligible and enjoyable to look at, both winners in the quest for knowledge… Go kids go. I think the children are just getting used to the idea of what the iPads can be used for. They were experimenting. A moment later, says Babs, the teacher suggested that perhaps they’d recorded enough for the moment, and the kids put ’em down and interacted with Ross Graham. It will be interesting to see how things play out over the year. I don’t think we can even imagine what the world will be like in 70 years. It’s fun to imagine though. What a cool exhibit! Looks like the kids were enjoying it too! You are absolutely right. We can’t, it is, it is indeed, and they were! I like imagining things. Once again you cruelly dangle attractions in front of those who who can’t get at them. Never mind, the picture of the recording children was worth a visit anyway. I’m glad to hear it. I will show you more of the toys one day, and tell you some stories, too. That was my first response too, but I hasten to say that the kids are still trying things out and becoming accustomed to the possibilities. Their teacher did have them stop recording and start interacting right after this photo was taken. It’s just like every other technology – having the conversation about what it’s good for – and what it’s bad for – is part of the story. Same with electricity and photography and freeze-drying food. Reminds me of lately, when I had to ask my 4 year old nephew to show me how the control of his families TV was functioning! I know the feeling! I had the same experience when I visited Rob the Firefighter and the Lady Alicia. Well, that takes my breath away and leaves me speechless! And you, Gerry, take it right in stride. Well! I have had more time to assimilate it. I have quite a few questions bouncing around in my mind, though. Quite a few. And each one worth an extended conversation. No wonder we are left breathless and speechless. I’ll just report this, without any grand conclusions. I have a 70-ish friend who’s gotten along just fine with a flip phone, a desk computer and a small laptop for travel. In June, she upgraded to a smart phone. I’m not sure which – I think iPhone. We used to take leisurely, uninterrupted walks. We used to travel together, having great conversations and stopping for interesting little things along the road from time to time. Now, her phone constantly is interrupting, with assorted sounds for text, email or call. It announces who is calling by name. When it makes a noise, she dives for it. And when it doesn’t make a noise? We went on a walk a couple of weeks ago, and I kept count. Over the course of an hour, she pulled it out eight times to check – well, who knows what she was checking. That’s roughly once every eight minutes. She’s become the person she used to shake her head over, and it took only six months. I think those things are the tech equivalent of chocolate. I know I’m glad the teacher had the children put their gizmos away for a time. At the moment I have checked myself into rehab – a house without an internet connection of any kind. (I am writing this at the Central Lake Library.) We’ll see how that goes, shall we? Meanwhile, I’m having excellent walks. Update December 27, 2012 – Oh dear, oh dear – I am in receipt of an email from a dear blogging friend who read that I’d “checked myself into rehab.” She was very worried about me. It just goes to show you how a flip remark can be misconstrued. I hasten to assure you all that I am in “withdrawal” only from at-home broadband service! I am writing this at the Elk Rapids Library, still having excellent walks, and reading a lot more books. I’ll get back to blogging soon. All things in moderation. I was once told by an artists, who works with lots of tools, that every tool is a toy before it’s a tool. I’m sure this is very true of children and iPads. And then there are things that are just toys forever . . . mostly large, noisy things. But yes, I agree, all of us learn about the possibilities that exist in an object or a material by playing with it. Same with words. 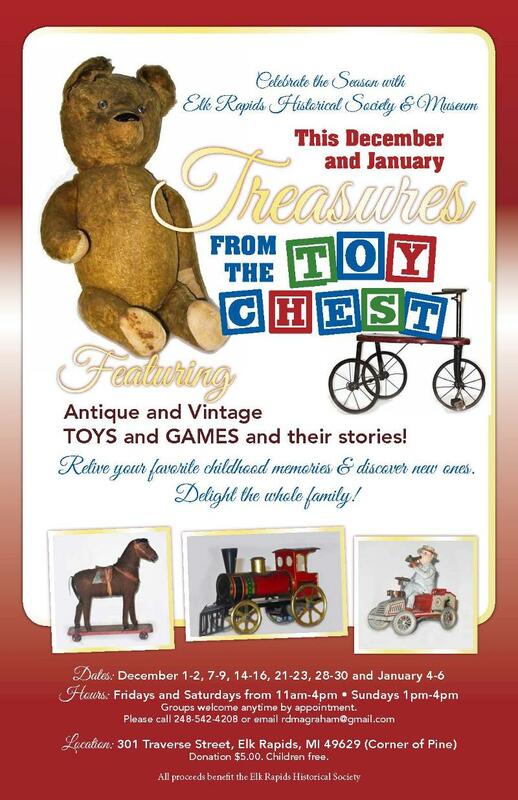 “Treasures from the Toy Chest”… this is certainly an exhibition I would love to visit. We have a “Toy Museum” not far from here. I have visited it several times with my two sons; no such “toys” as the ones Babs photographed existed then. All visitors were and still are encouraged to play with the toys and games at hand. Wonderful afternoons we spent there, adults and children enjoying it alike. Thanks to both of you to bring back such memories. Merry Christmas, dear Gerry, thanks for all you share along the year. All the very best to you. Glad to know you’re only rehabbing from electronics…lol…and that you’re reading books and taking walks. Pat Cowboy and Sadie for me, ok? Thank you, and to you as well Dawn!